Below i tried to cover the scenario where multiple docbases are configured and provides a solution to various business requirements that may arise out of this kind of set up. It also illustrates the configurational change that makes webtop (till version 5.3 SP4) compatible with Internet Explorer 7.0.
Business Scenario: There are multiple environments (say Development, Test, Staging and Production). Each has its individual content server but the requirement is to connect to any one of these environment through a single application server. 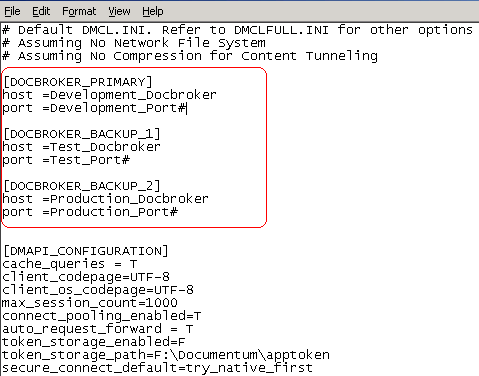 Solution: Add the different docbrokers in dmcl.ini as backup. 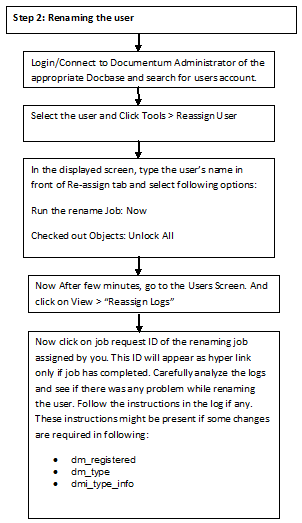 This allows the application server to connect to the docbase for which the login credentials are passed. The content server requires user id, password and docbase name as the parameter for creating a session for the user. The request from application server first goes to the docbroker specified as primary. If the parameters passed in the request matches with that of the docbase listening on the primary docbroker, the session will be created otherwise the request will be forwarded to the backup docbroker specified in the dmcl.ini in the ascending order. If the docbase name in the different environments is different (or even if the case is different i.e. docbase_name and DOCBASE_NAME are treated as different docbases). User id or login ticket is unique. Business Scenario: Multiple content management applications are sharing the same set of content and application server. The docbase and webtop is separate for each of the application. The requirement is to default the docbase name in the webtop login screen for each of the application. Solution: Add the following code snippet in the app.xml file located under webtop\custom folder. Add the following code snippet to app.xml file located under webtop\custom folder to make webtop (till version 5.3 SP4) compatible with Internet Explorer 7.0. 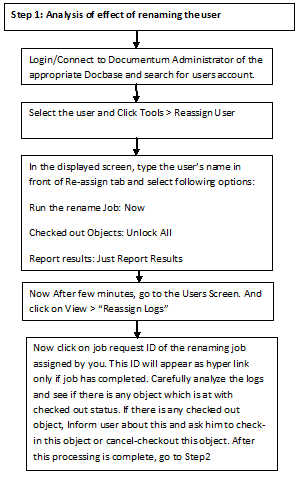 The process which can be used to unlock the document is described in below flowchart. It is a two step process. In step1, we have to obtain the object ID of the document using DQL. 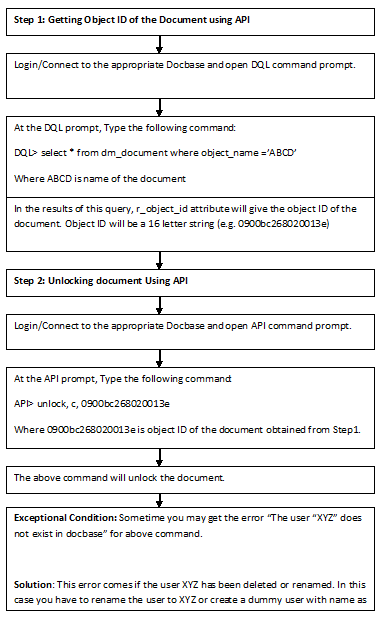 In step2, Document has to be unlocked using API command. Out of the four statuses Unfrozen and Frozen are the primary status and Chilled and Published are just intermediate stages. When a Virtual document is unfrozen, we can make changes to the document that the virtual document points by checking out that document (Through VDM) and editing its contents. After the edition is done and the document is saved and checked back in then the Virtual document will now point to the new version of the document so that the changes come into effect and not the old version. When a document is frozen then the links that point to the document are permanent. Once a new version of the document is created the link in the virtual document will still be pointing to the previous document itself (i.e. the document version that the virtual document was pointing to when it was frozen) .Even though the new version of the document will exist in the repository the virtual document will be pointing to the old version which the virtual document was pointing to when the virtual document was frozen. A virtual document status can be promoted from unfrozen to frozen or demoted from frozen to unfrozen. Even each section of the virtual document can be frozen or unfrozen individually. The most important feature of documentum is that it is customizable and so the company or individual purchasing it can customize the application according to his own convenience. One of the most important feature in documentum is the virtual document manager. Virtual document is a document which enables the user to link several related documents together. In a virtual document there are links to many related documents which together will constitute a single document known as virtual document. A virtual document does not actually contain any documents .It consists of the links to the various documents. The documents will remain in their original position in the repository and the link to that position is copied into the virtual document so that when we click on the document inside the virtual document the document will be displayed from the original location itself. The document link is can be put in the virtual document simply by dragging it into an empty position. Also documents can be added and deleted from a virtual document section. 1. Assemblies-A virtual document itself is an assembly of related documents. This virtual document will consist of many subassemblies inside the main assembly. An assembly is a collection of a group of documents which are linked to each other in a more granular level. Each individual assembly can be saved separately or can be stored as a whole along with the main virtual document assembly. 2. Sections-A section is a part of a virtual document which is a collection of many related assemblies. A section is somewhat similar to the cabinet in a wardrobe. Each virtual document will have many sections containing many assemblies. The status of each section can promoted or demoted. 3. Links to related documents-Each document shown in the virtual document is not a copy the actual document; instead it’s a link pointing to the original document inside the repository. 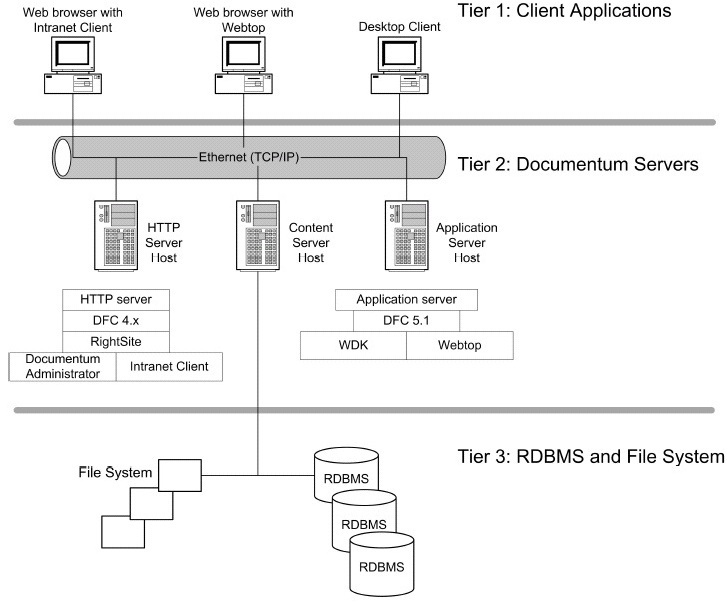 Docbases are supported by a three-tiered architecture , as in below figure. • At the top level, client applications allow users to create, edit, and view documents and modify metadata. • At the middle level, Content Server handles requests from Documentum client applications. Application logic is located on the server, and RDBMS calls are made using server API calls. • At the bottom level, the RDBMS server and the operating system handle requests from Content Server and store information on the file system or in RDBMS tables.